Hypothermia prevention is better than a cure. That’s why more and more hospitals are using Thermoflect® Heat Reflective Technology®, a trusted proactive protocol that’s protected at-risk patients from unplanned hypothermia for over 25 years. Thermoflect heat-reflective technology reflects endogenous heat and prevents convective heat loss. Under normal circumstances, the human body maintains a steady internal (core) temperature ranging from 36.6°C to 37.5°C (97.9°F-99.5°F). HYPOTHERMIA is a core body temperature of less than 36°C (96.8°F). Medical facilities and Emergency Medical Services are constantly battling the clinical implications of hypothermia and its adverse effects on patient recovery, outcomes and the cost of treatment. Hospitals that participated in the Surgical Care Improvement Project (SCIP) evaluated the benefits of Thermoflect in reducing the negative consequences of hypothermia in surgical patients. SCIP is a national partnership of organizations focused on improving surgical care by significantly reducing surgical complications. The Solution: Thermoflect® Heat Reflective Technology®. Proven, durable, cost-effective. Thermoflect prevents hypothermia by preserving–or banking–a patient's core body temperature. Thermoflect is a simple solution to hypothermia that utilizes NASA pioneered science instead of electricity. The innovative Thermoflect material reflects a patient's endogenous radiant heat, banking it in the body's core, while preventing convective heat loss (wind chill). The material is lined with a soft, patient-friendly inner surface. Thermoflect products are cost-effective, ultra-lightweight yet durable, and move easily with the patient throughout the perioperative journey. Thermoflect is so trusted, it has become a part of the US Military's Hypothermia Prevention Protocol. Thermoflect has proven effective in a variety of applications, including healthcare, EMS and survival gear. "Although OR staff hoped using Thermoflect would improve patient comfort levels, results from additional benefits were more dramatic... P.A.C.U. staff have documented an 87.5% reduction in patients arriving...with temperatures below 36 degrees." RADIATION is direct loss of heat energy via the invisible infrared wavelength range. In the human body, it is the largest source of heat loss, accounting for about 65% of the total loss. CONVECTION is heat loss due to circulation of the surrounding air currents and explains the so-called "wind-chill factor." Convection accounts for 25% of body heat loss. The high air exchange rate in most operating rooms increases the loss of heat through convection. Using Thermoflect® is as easy as 1, 2, 3! Optimum hypothermia prevention must begin while the patient is warm before entry into the OR Suite (Bank the Heat to Beat the Chill). Cover the patient as early as possible. 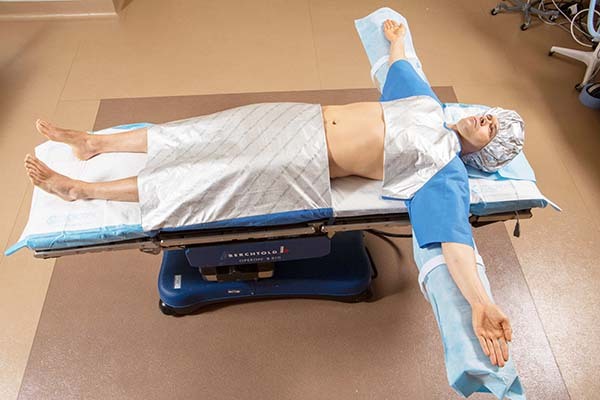 Cover the patient's maximum body surface area–tucking the material around the patient to help seal in the heat. Maintain maximum coverage throughout all perioperative phases–PREOP, INTRAOP and PACU. 1 Gyn Physiology, Leigh Simpson, MD. University of Tennessee, Resident Didactic Series. November 11, 2004. http://www.utmem.edu/ obgyn/res_pres/Gyn%20Physiology.ppt. Thermoflect Reflective Heat Technology is available in a full line of hypothermia prevention products for patients that have been specifically designed for use in medical facilities and EMS. Our Thermoflect Trauma Transport Cocoon is widely used by Emergency Medical Services throughout the country. Thermoflect is also available in staff apparel to keep providers warm, too! "For trauma patients, or for any patient that has, or may have, the potential for a decrease in core temperature, it is a must... We use it for trauma, long outside exposure, blood loss... We have had excellent results... We would recommend it very highly for anyone..."
Q. What is the purpose of Thermoflect? A. Thermoflect is a unique patient warming material used to prevent hypothermia, thereby improving a patient's clinical outcome and reducing costs. Q. How does Thermoflect reduce healthcare costs? A. 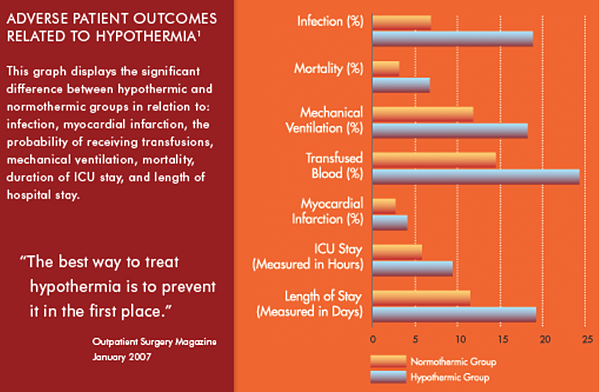 Managing hypothermia helps reduce the length of hospital stays. By reducing surgical site infections (SSIs), it reduces the need for additional medications. A. Evidence-based practices confirm SSI rates are more than triple in hypothermic patients. The key to reducing this and associated risks is prevention. Q. How is Thermoflect used most effectively? A. For optimum results, Thermoflect should be used according to these three principles. A. It can make a big difference. Pre-warming the patient for at least 15 minutes before the induction of anesthesia should be considered for patients at risk of unplanned hypothermia. Warming the patient's skin and peripheral tissues prevents redistribution hypothermia. Q. Can Thermoflect be used in conjunction with other warming methods? A. Yes. Thermoflect can be supplemented with either warmed cotton blankets or forced air re-warming. Q. Can Thermoflect be sterilized? A. Yes. Thermoflect can be sterilized with ethylene oxide. However, the need for sterilization is not common because a sterile drape is typically placed over Thermoflect. We invite you to try Thermoflect® Heat Reflective Technology® products in your facility. Thermoflect heat reflective technology products are simple, safe and effective.